There are two main ways that woodpeckers and occasionally other birds remove bark in search of insects beneath it. One is bark sloughing, where a bird pries off the entire dead layer of bark on a tree (see NC post on 12/5/14). Another method of locating insect larvae that both woodpeckers and nuthatches employ is the removal of individual scales of bark. This is referred to as bark scaling. 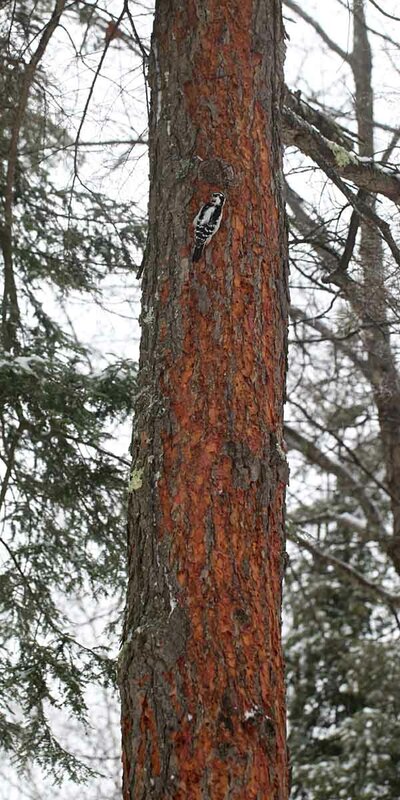 The pictured hairy woodpecker has removed much of the bark of a dead eastern hemlock using this method.